Catalonia experts online since 1997, let us help you find your ideal rental property & provide you with the info you need to make the most of your holiday. Friday to Friday rentals in mid and high-season: Low-season, 3/1-31/5 & 27/9-22/12: €2075/week. Mid-season, 31/5-28/6 & 30/8-27/9: €2500/wk. High-season, 28/6-30/8: €3400/wk. Off-season weekend rates: €1400 plus €200 per extra night. NB: -5% off for 2 weeks except in high-season! In our listings since 2002, 14+ guests in 6 bedrooms, 4 bathrooms, this is undoubtedly the most "complete" of the medium-sized farmhouse-type villas we offer, a gorgeous house and garden with all the extras you need to stay busy in a beautiful setting not far from from the touristy coast. 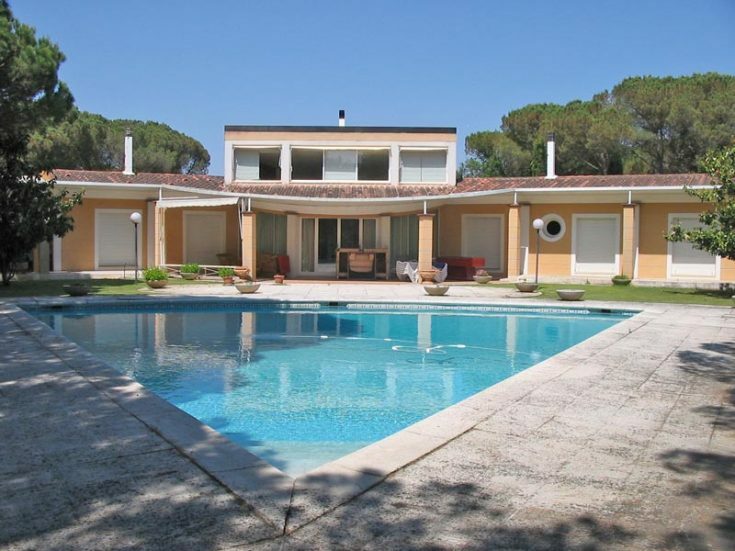 In addition to the fine house, with all the modern conveniences and with a lot of charm (terra cotta floors, high wooden beamed ceilings, nice tiled bathrooms and kitchen, etc...) this villa offers the following: a fully fenced 10x6m swimming pool, a new paddle tennis court, a FULL INDOOR SPA! consisting of Jacuzzi, sauna, & Turkish steam bath, a small Astroturf football pitch with goalposts, a tennis wall for playing "fontón": a play area for kids with swings & a doll house & slide. not to mention the usual ping pong and football table, as well as Wi-Fi and Canal+ cable TV too! Average price per person per night based on 14 guests = €21 in low-season & €34 in high-season. Saturday to Saturday rentals in mid and high-season: Now -20% off listed rates for available dates from June to September of 2019 ! Rates based on up to 34 guests. Small supplement €90 to €125 per week for additional guests. Low-season: (3/1-30/3 & 2/11-21/12): €4.1250/week Low to Mid-season: (30/3-15/6 & 14/9-22/11): €4.970/wk. Mid-season: (15/6-6/7 & 31/8-14/9): €5490/wk. High-season (6/7-31/8): €6.680/wk. Off-season weekend rates: €2.355 for 2 nights + €775 per extra night. NB: 5% discount for 2 week bookings. Weekday to weekday rentals preferred in low-season, not taking up 2 weekends! Now -20% off listed rates for available dates from June to September of 2019 ! In our website since 2000, sleeps 40 or so in 17 bedrooms, 15 bathrooms: a unique and very attractive baronial mansion (1200 m2 on a 15 hectare private property), Mas Dalt occupies a privileged hillside position just above the historic lakeside town of Banyoles, with majestic views over the coastal plain of the central Costa Brava. There are three distinct, fully independent & fully equipped living quarters, each with its own full kitchen, large living room, dining room, terraces, BBQs, etc. Highlights include a 120 m2 living/playroom - perfect for large indoor gatherings, and a gorgeous 100 m2 outdoor dining terrace seating 40+ with great views just above the 12x5m fenced swimming pool. Feedback from past guests is excellent! 1 km walk from this house is Can Tapies - see next house. Sometimes the two are rented together for large gatherings such as weddings or corporate brain-storming events in the off-season. Excellent catering/cook options available at very affordable rates! Free WiFi and lots of nice extras! Average price per person per night based on 34 guests = €17 in low-season & €27 in high-season. Friday to Friday rentals in mid and high-season: Now -20% off normal rates for available dates from June to September of 2019 ! Low-season: (7/1-29/3 & 27/9-20/12): €3.490/week. . Mid-season: (29/3-5/7 & 30/8-27/9): €4.730/wk. Mid-season plus: 15/6-6/7 & 31/8-14/9): €4.530/wk. High-season: (5/7-30/8): €5.430/wk. Off-season weekend rates: €1.750 for 2 nights plus €500 per extra night. NB: -5% for 2-week bookings. Rates based on 25 guests. Small supplement for additional guests, up to €125 per week in high-season. 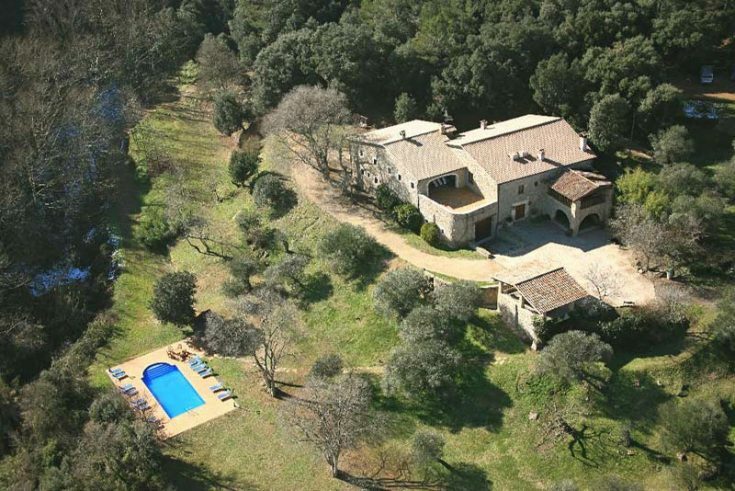 Working with owners since 2000, sleeps 25+ in 12 large bedrooms, 9 full bathrooms + 3 WCs, Can Tapies is a magnificent 1100 m2 baronial stone mansion consisting of three fully equipped and independent apartments on a gorgeous hillside property overlooking the Costa Brava. One apartment has 5 en suite bedrooms, another flat has 3 en suite bedrooms, and the third flat has 4 bedrooms sharing a double bathroom. It is very important to stress here that these are not 3 apartments crammed into a normal farmhouse. The house is huge and each apartment is very generously proportioned, with full kitchen, a large living/dining room, big bedrooms, private terraces, and each flat set well apart from one another for privacy. There is a new 100m2 playroom with billiard, ping pong, and table football. The newly fenced 12x5m swimming pool is set in an olive grove just below the house and next to a football pitch with goalposts. The views out over the coastal plain are fantastic! Great for larger groups but as you can see priced for smaller groups who might just want a little extra space! Excellent catering/cook service available, €12 per cook per hour or pay prix fix menu at either indoor or outdoor bbq dining areas for all guests seated together. Free WIFI internet. Saturday to Saturday rentals in mid and high-season: Now -15% off listed rates for available dates from June to September of 2019 ! Rates based on 25 guests. Small supplement of up to €90 to €125 per week for additional guests. Low-season: (4/1-30/3 & 28/9-21/12): €3.100/week - that's just €17 per person per night! Low to mid-season: (30/3-25/5 & 31/8-28/9): €3.640/wk. Mid-season: (25/5-22/6): €4.370/wk. Mid-season Plus: (22/6-13/7): €5.200/wk. High-season: (13/7- 31/8): €5.665/wk. Off-season weekends: €1.600 for 2 nights, plus €400 per extra night. NB: 5% discount for 2 week bookings! Now -15% off listed rates for available dates from June to September of 2019 ! In our listings since 1999, up to 30 guests in 12 air conditioned bedrooms, 7 bathrooms + 2 WCs. Located 20 km south of Girona, one hour north of Barcelona, and 20 km inland from Lloret de Mar and the other southern Costa Brava resorts. 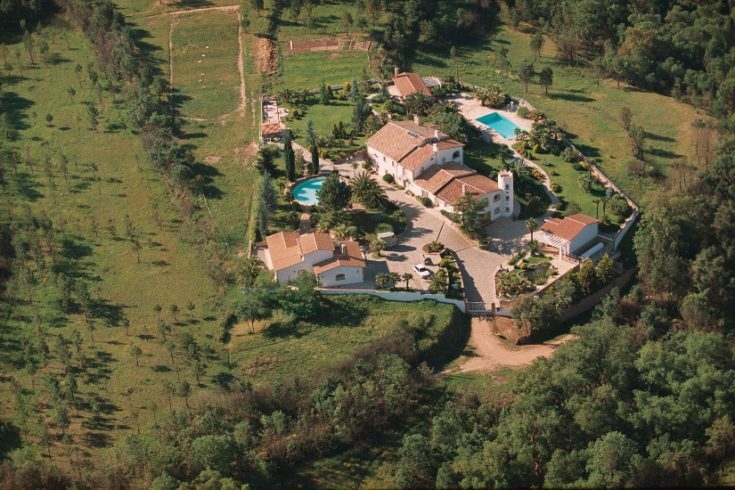 This is a huge "luxury" estate (sorry for using the often abused "L" word - I usually don´t - but this one in so many ways deserves it) originally dates from 1583, has 8,000m2 of gorgeous private gardens, two very large swimming pools, and a nice poolside dining area seating over 50 guests (outdoor kitchen with BBQ & bathroom & changing room too). This walled villa with remote control gate is the kind of place you might see on TV except that Can Cunill really does have a lot of old-world charm, with old terra cotta floors, wooden ceiling beams, hand painted tile work, and nice details everywhere to please the eye. The main house has 10 bedrooms for 22 or so guests and the ex-guardian's 2 bedroom house has beds for 6 guests, and there are a couple of extra beds that can be placed as needed, not to mention the cots for babies. This is a house with a lot going for it! One of my favorite features is the double kitchen, with two of everything (two sinks, two hobs, 2 dishwashers) plus an indoor BBQ! Even if you can't afford to stay here - and if you can you probably should, especially in the off-season, where the price is a steal! - you might like to take a quick look at this house just for the fun of it. I've seen lesser villas going for twice the price! Free Wi-Fi. Be sure to see the 9-minute movie in YouTube. Per person rates = €17/night in low-season to €32/night in high-season, based on 25 guests. Saturday to Saturday rentals in mid and high-season: Low-season, 4/1-1/6 & 28/9-22/12: €2500/week. Mid-season: 1/6-29/6 & 31/8-28/9 & Christmas/New Years: €3000/wk. High-season, 29/6-31/8: €4500/wk. Off-season weekend rates: €1600 for 2 nights plus €250 per extra night. NB: -5% off for 2 weeks except in high-season! A classic! In our listings since 1998, 22+ guests in 8 to 10 bedrooms (I'll explain!) 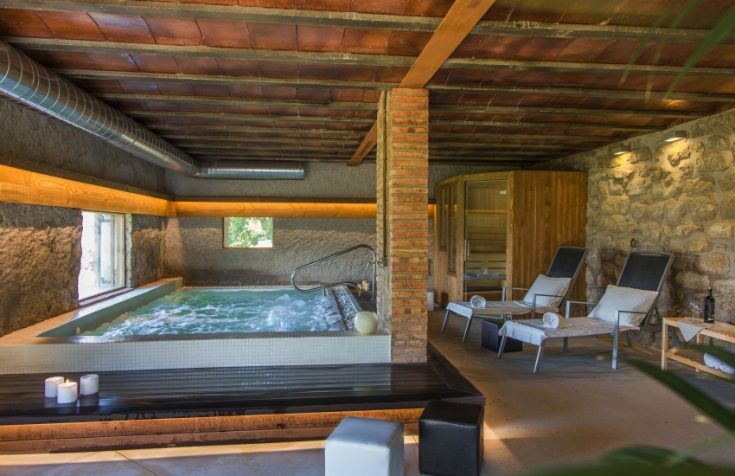 & 6 bathrooms, this amazing fortified 12thC stone masia, a 900m2 "museum-house", located in an idyllic 105 hectare hillside property just 8 km south-west of Girona, is undoubtedly one of our most popular villas. Beautifully restored and tastefully furnished, the 8 main bedrooms are set far apart from one another, separated by several different sitting rooms and private terraces. Along with the usual amenities such as the large fireplaces and lovely patio with bbq meals under ancient vines, there is also a good-sized & fully fenced swimming pool (5 x 10 meters) and a spectacular new FULL INDOOR SPA, with a large Jacuzzi, steam bath & sauna, all on a lovely hillside overlooking an ancient village with amazing views of the pre-Pyrenees tumbling out towards the sea. Games include a pool table and table football and ping pong. 2 tennis courts at the caretaker's restaurant 1 km away, no charge. Paddle court at owner's house next door. This house has always been one of our best performing rentals and the feedback since 1998 is amazing. Free Wi-Fi. Average price per person per night based on 20 guests = €17 in low-season & €32 in high-season. Friday to Friday rentals in mid and high-season: Rates based on 17 guests, supplement per week for extra guests between 90 & 100 € depending on season. Low-season: 2/1-3/6: €2,600 /wk. 3/6-12/7: €2,900 /wk. 12/7-16/8 & 17/12-2/1: €3,250 /wk. 16/8-27/9: €2,900 /wk. 27/9-17/12: €2,600 /wk. In our listings since 2001, 19 or so guests in 9 bedrooms, 4 bathrooms, this huge farmhouse dating from the 17thC is on the same huge farm as Peus Curts and is situated just behind the owners house. Indoors I can highlight the unusually large (60m2) dining room and the spaciousness of the bedrooms. Outdoors, there is the new 8x5 meter COVERED AND HEATED SWIMMING POOL for year-round swimming at 29ºC, and the large covered BBQ area with outdoor fridge, food prep area, seating for over 20 guests, plus games for the kids such as ping-pong and babyfoot, all set on a high terrace with unspoiled views of the valley below. Need a big place? This might be the one, especially in the off-season due to the heated & covered pool. Free Wi-Fi internet. Average price per person per night based on 19 guests = €18 in low-season & €23 in high-season. Saturday to Saturday rentals in mid and high-season: Low-season: €2,415 /week. Easter: €2,760 /wk. mid-season: €2,760 /wk. high-season: €3,275 /wk. Christmas: €2,760 /wk. Low-season weekend rate: €1,300 for 2 nights + €300 per extra night. In our listings since 2003, 17 or so guests in 8 bedrooms & 5 bathrooms, this is a good example of how you can get more house for your money if you are willing to rent further inland. Another large and beautifully restored farmhouse, originally dating from the 15th century, Can Pou has a feature many of you will like: this house was originally divided into 2 separate independent halves, so there are now 2 fully equipped kitchens, 2 elegant living/dining rooms, etc. So 2 or more families can be together when they want to, but also have their own private living space to retreat to. Situated on a huge property with great panoramic views (I counted 4 mountain ranges), a nice fenced-in 8x5 meter swimming pool, and an atmospheric indoor play room with ping-pong. Some houses have an exceptionally nice interior, and some houses have an exceptionally nice exterior, but a chosen few, like Can Pou, have both. Free Wi-Fi internet. Average price per person per night based on 17 guests = €20 in low-season & €27 in high-season. Friday to Friday rentals in mid and high-season: NB: Monday to Monday preferred in high-season. Rates for up to 16 guests. Small supplement for additional guests of €80 to €100/week. Christmas: 18/12-2/1: €3,175 /wk. Low-season: (2/1-29/4 & 2/9-17/12): €1,960 /wk. Mid to low: 29/4-17/6: €2,500 /wk. Mid: 17/6-15/7 & 19/8-2/9: €2,850 /wk. High-season: 15/7-19/8 & Christmas: €3,175 /wk. Monday to Monday rentals in Mid and High Season. Weekend rates: €1,300 for 2 nights + €300 extra night. In our website since 2005, 19+ guests in 8 bedrooms & 8 bathrooms. Wow! I know this is just the sort of villa many of you are looking for. Whereas so many of these huge houses have lots of bedrooms but relatively few bathrooms, this house has 8 bedrooms, each and every one with a nice private bathroom. 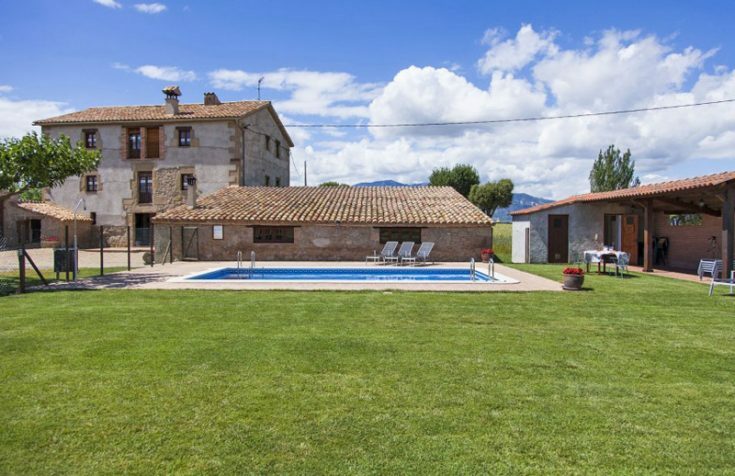 El Cosme is a large farmhouse (330m2), originally dating from the 18thC, restored in 2004 with rentals in mind, and sits on a huge property (150 hectares) in an idyllic spot with majestic views of 4 different pre-Pyrenean mountain ranges, a fenced 9 x 4.5 meter private swimming pool, and nice outdoor covered BBQ dining porch with seating for all & a second outdoor refrigerator, and there is a barn converted into a play room with ping pong and table football. I know this one is going to be much in demand! Now with free Wi-Fi internet. Average price per person per night based on 16 guests = €16 in low-season & €27 in high-season. In our website since 2003, up to 18 guests, 7 rooms, 8 baths, although named "the cabin", this very attractive restored 18th C farmhouse is enormous and quite luxurious, all rooms with private bathroom, several large living rooms, a well-equipped kitchen, the poolside covered BBQ area, and now with a huge banquet & play room of over 120 m2, and a new paddle-tennis court. The fenced 9x4.5 meter swimming pool is right next to the outdoor BBQ dining area. 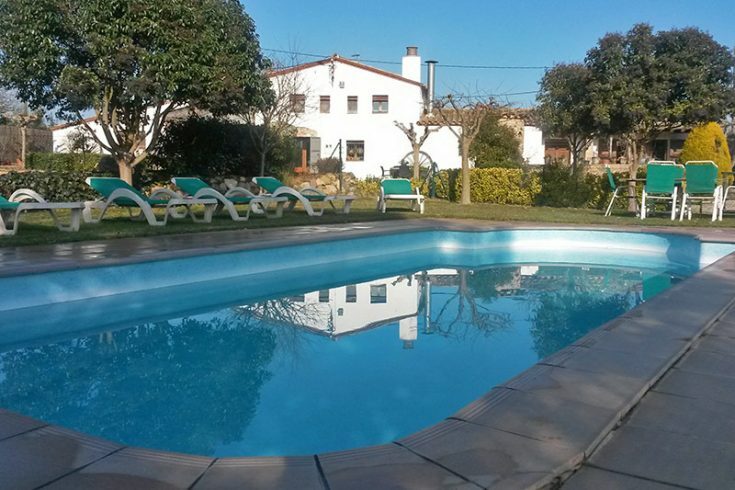 Located just outside (a few minutes' walk) of Casserres town, about an hour from Barcelona city center, this is one of the few villas in the area where you caneasily walk to shops/restaurants/cafés. While still in a country setting, there is nothing like a brisk morning walk for warm bread and croissants for breakfast! Excellent feedback, gorgeous house & garden. Free Wi-Fi internet. Average price per person per night based on 15 guests = €22 in low-season & €27 in high-season. Saturday to Saturday rentals in mid and high-season: Low-season: (4/1-13/4 & 28/9-22/12): €1900 /week. Easter to mid-season: (13/4-25/5 & 31/8-28/9): €2415 /wk. mid-season: (25/5-29/6): €2645 /wk. high-season: (29/6-13/7 & 24-31/8) €2990 /wk. peak-season: (13/7-24/8) €3335 /wk. Low-season weekend rate: €900 for 2 nights + €300 per extra night. NB: discounts for longer bookings except high-season. In our website since 2001, up to 18 or so in 7 en suite bedrooms, an old farmhouse with lovely pool area in a 4.700 m2 fully fenced garden, remote-control gate & a very nice new outdoor covered BBQ shed right next to the kitchen. 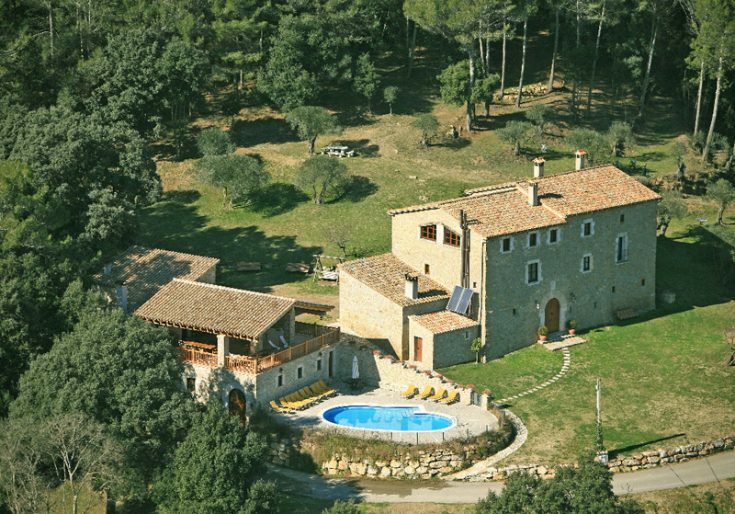 Cal Micos is just 8 km off the AP-7 highway between France and Barcelona, about 17 km inland from the coast at Lloret or St Feliu & set amid broad undulating fields & surrounded on three sides by different low pre-Pyrenees mountain ranges. The views are just gorgeous! Originally dating from the mid-18th C, this villa offers comfort - all rooms have a private bathroom - a 9x5m swimming pool, fenced for child-safety, set on a shady & very well-kept garden. I should insist on the good location, 2 km to Riudarenes town & shopping, 17 km to beaches, 20 km to Girona, and 70 quick highway km to Barcelona, or take the commuter train every hour 6 km away in Sils. Not fancy but a solid house, moderately priced, and a lot going for it! Free Wi-Fi, ping pong, and a horseback riding club just across the country lane! Average price based on 16 guests = between €16 in low-season to €24 in high-season per person per night. Friday to Friday rentals in mid and high-season: Rates based on 15 guests*: Low-season: 2/1-26/4 & 30/8-20/12: €1.625 /wk. 26/4-28/6: €2.010 /wk. 28/6-19/7 & 16-30/8: €2,550 /wk. high-season: 19/7-16/8 & 20/12-2/1: €2,800 /wk. Weekends: €1,200 for 2 nights + €275 extra night. * Supplement of €70 to €100, depending on season, for additional guests. In our listings since 2003, 15+ guests in 7 bedrooms & 3 bathrooms, on an hilltop with spectacular panoramic views of the impressive Berguedá mountain range, this spacious 290m2 house on a 150 hectare farm offers a 8x4m meter fenced swimming pool along with a great outdoor covered BBQ and dining area with ping-pong and table football. The house has 6 double rooms and a triple room and some extra beds that can be placed where needed, two living rooms, 2 TVs, 2 refrigerators as well as the usually appliances. An attractive place, with plenty of play room under remarkable 100 year-old oak trees on the lovely esplanade. With great walks from your front door, including to the town of Gironella, 1 km away, one of my favorite market towns in the region, this house is a winner! Free Wi-Fi internet. Average price per person per night based on 15 guests = €15 in low-season & €26 in high-season. Saturday to Saturday rentals in mid and high-season: Low-season: 2/1-15/6 & 28/9-22/12: €1.900/week Rates by dates: 15/6-29/6 & 31/8-28/9: €2.240/wk. 29/6-13/7: €2.860/wk. 13/7-31/8: €3.100/wk. Low-season weekend rate: 1100 Euros for 2 nights and €300 per extra night. Beds for 15 plus 2 fold outs in 6 bedrooms, 5 bathrooms & 2 WCs, recommended especially for groups with children! 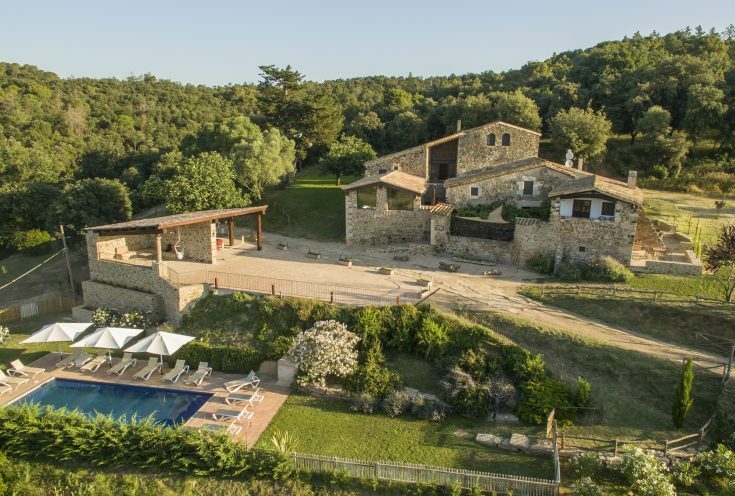 This is a very attractive recently renovated 17C stone farmhouse situated 3.5 km from Riudarenes, 18 km inland from Lloret and Saint Feliu de Guixols beaches on the coast, an hour up the AP-7 from Barcelona. This property has a lot going for it: a spacious house of history and character on a beautifully landscaped garden with lawns and trees and flowerbeds, a larger-than-most 10x5 meter private fenced swimming pool, and an excellent outdoor covered dining area conveniently situated between the BBQ and kitchen. But perhaps most impressive of all are the many play areas for children, including ping pong table & a babyfoot, a sandbox & dollhouse and even an 8 hole mini golf! This a very impressive new addition to our listings. One week bookings welcome in high-season. A great new property for adults and kids alike! Free Wi-Fi. Book early! Average price based on 15 guests = between €18 in low-season to €29 in high-season per person per night. In our listings since 2006, 13+ guests in 6 bedrooms, 5 bathrooms. What a wonderful garden and pool and BBQ area! Just perfect! 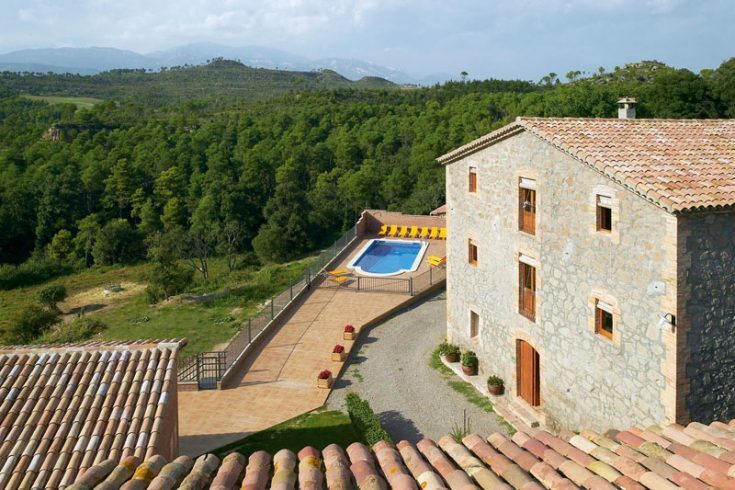 Casadevall is a notable exception from the usual sort of rustic farmhouse property we normally offer. This is the modern 350 m2 house of a local architect, situated in a 10 ha private fenced & wooded property, mostly Mediterranean pine and cork oak, a 10-minute walk outside of the town of Sils, 65 km north of Barcelona, a short to the commuter train (1h & €6 to Barcelona city center). Built some 20 years ago, this designer house has 6 bedrooms (2 en suite) and a total of 5 bathrooms, along with a 4-person sauna and an exercise room with weights and nautilus machines. But again by far the most outstanding part of the villa is the garden, with its large triangular unfenced swimming pool, the lovely covered BBQ dining area just out from the kitchen, and the porch, with 4 outdoor sofas & chairs, and an outdoor bathroom just beyond the pool. It is one of the nicest gardens of any of the houses I offer. A gorgeous private setting under the soothing shade of fragrant pines! Free Wi-Fi. After 12 years, we´ve sadly lost this house. The owners have signed up with one of those agencies that does all the cleaning and receives guests - full service for the owners. Sounds great. So whats the problem? These agencies double the price on you, the rentee and the service is lousy! They even offer catering and you should see the warehouse where they prepare everything celophane wrapped... I am keeping the listing here because we have some bookings through next summer. Saturday to Saturday rentals in mid and high-season: Rates based on 15 guests. Extra bedroom: €600/wk. Max. 20 guests. Extra beds €90/week. Low-season (1/1-26/6 & 31/8-31/12) from weekday to weekday: €2,050 /wk. Low-season (1/1-26/6 & 31/8-31/12) taking up two weekends: €2,750 /wk. Mid-season (25/6-20/7 & 24-31/8): €2,645 /wk. High-season (20/7-24/8): €3,050 /wk. Low-season weekend rates: €1,350 Euros for 2 nights plus €300 per extra night. 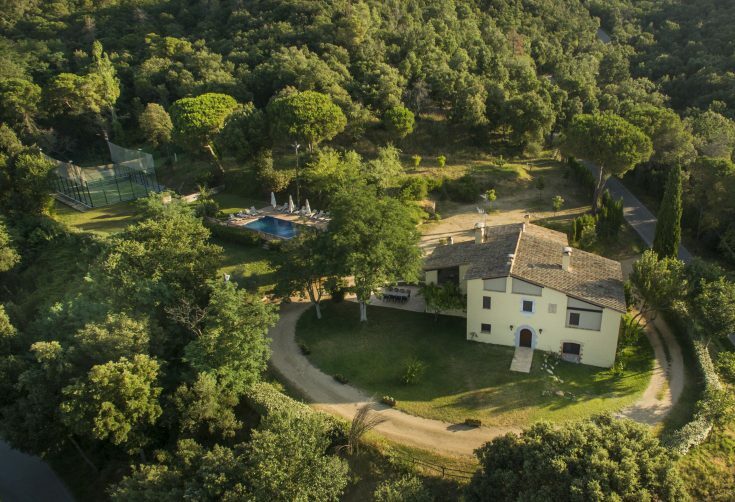 In our listings since 2005, 17+ guests in 7 rooms, 6 baths, this newly renovated high-quality & very attractive farmhouse property is situated just outside of Casserres (1.5 km) on a huge hillside farm with a well-kept pine forest one hour north of Barcelona. As you will see in the photos, this is a beautifully decorated house with some exceptionally nice extras, like the separate FULL INDOOR SPA building with small indoor heated pool, sauna, Jacuzzi, and steam shower, in addition to the fully fenced swimming pool measuring 5x9 meters on the wide grassy lawn, the outdoor bbq area, and indoor and outdoor play areas for kids with swings, ping pong, etc. Until recently, this house was offered in exclusivity (and for double the price) in the catalogue of a well-known, up-market English rental agency. 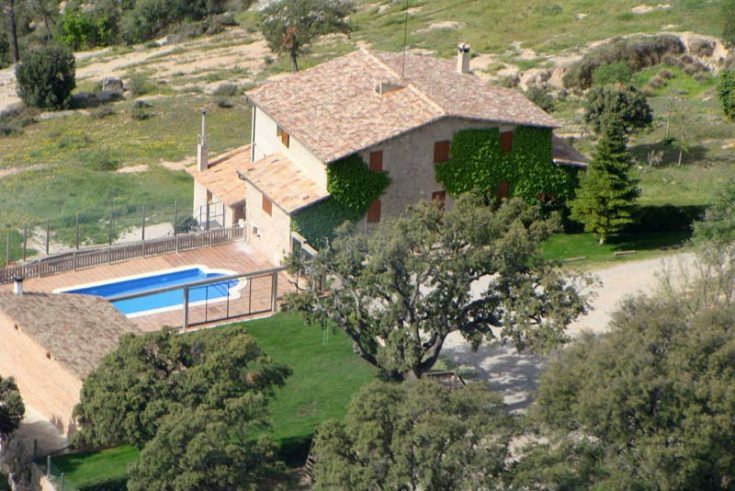 I´m very happy to be offering this villa at its normal, far more competitive rates! Now with a new separate 7th en suite bedroom with kitchen and fireplace. Spa prices = 2 free hours included, then €2 per hour. Free Wi-Fi internet. Average price per person per night based on 15 guests = €22 in low-season & €29 in high-season. Saturday to Saturday rentals in mid and high-season: Rates based on 14 guests: small supplement per week for additional adult guests. July: €2,300 /wk. August: €2,450/wk. Rest of year: €1,850/wk. Low-season weekend rates: €850 for 2 nights plus €250 per extra night. In our website since 2000, 14+ guests in 6 bedrooms, 4 full baths, a truly a magnificent farmhouse! 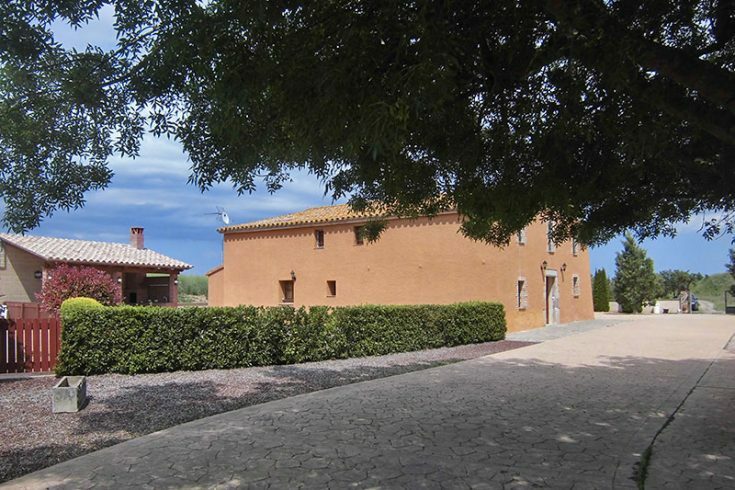 Originally dating from 1238, Can Rovira was last "modified" to its current dimensions in 1765 and is my kind of rustic place with lots of character. Spacious (over 400 m2 on three floors), well furnished with some good antiques, on a large private property. Now with a large 10x6 meter fenced swimming pool and covered outdoor BBQ dining area, and only 350 meters walk from the owner's son's Michelin one-star rated restaurant specializing in organic locally produced meats and veggies. This house offers an excellent price-quality relationship, especially considering the large size of the pool! Free Wi-Fi. Average price per person per night based on 14 guests = €18 in low-season & €25 in high-season. In our listings since 2005, up to 12 guests in 5 bedrooms & 5 bathrooms, a beautifully restored house in an unbeatable location, just off the greens of the new PGA golf course at Caldes de Malavella. 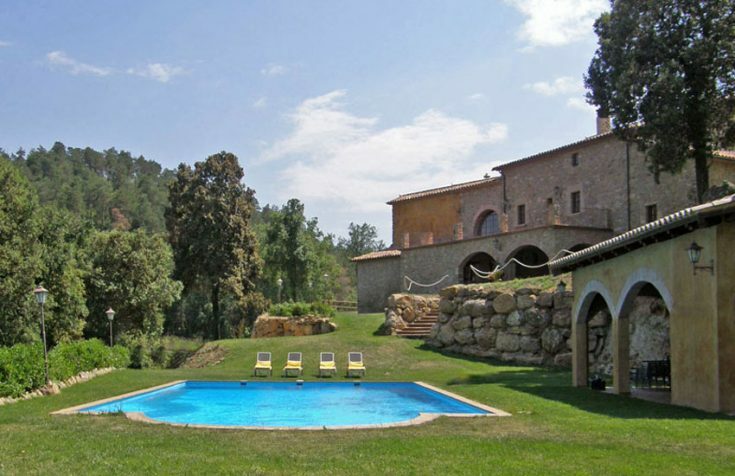 This is 12 km south of Girona town, 15 km inland from the middle Costa Brava beaches like San Feliu de Guixols. Aside from the attractive interior, including 2 air-conditioned living rooms and a separate dining room and kitchen, there is a lovely Japanese-inspired landscaped & walled garden with a lovely outdoor bbq dining area lit for al fresco dining, and a private fenced-in 8x5m swimming pool. 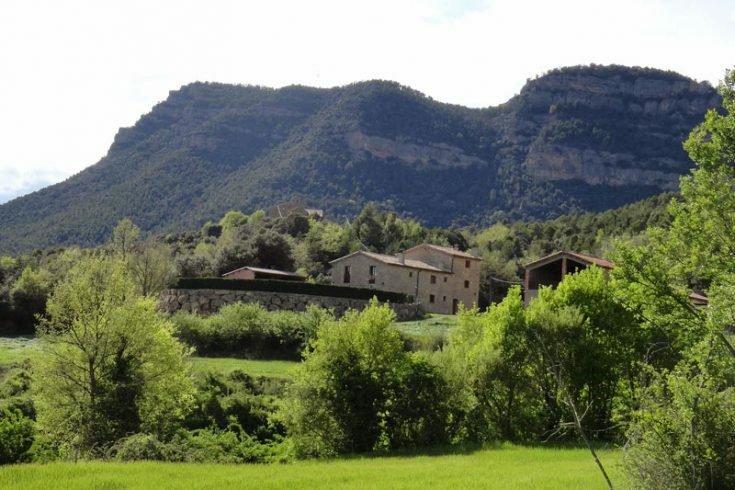 I have stayed here myself several times and I am very enthusiastic about this new house, which is also 4 km to the commuter train in Caldes to Barcelona (every half hour, 1 hour ride) and just 1 hour from Barcelona on the fast AP-7 highway. Good feedback and excellent price-quality relationship, especially in off-season. Recommended! - even if, like me, you don't play golf. Free WiFi. Average price per person per night based on 10 guests = €13 in low-season & €25 in high-season.